Viewers of Animal Planet’s “My Cat From Hell” know Jackson Galaxy as the guy with the guitar case full of cat toys and a knack for talking recalcitrant cats down from the ceiling. Who knew he also could be a design muse? 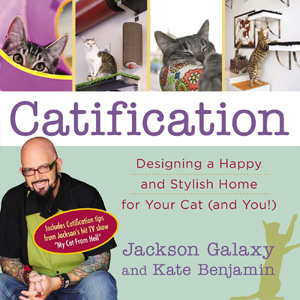 Worried by the “aesthetic panic” that some of his clients seem to display at the idea of incorporating cat toys and furniture into their interior design, Galaxy produced this book to demonstrate how stylish it actually can be. Galaxy and co-author Kate Benjamin start out by exploring the unique ways that cats see the world and by analyzing the ancient “Raw Cat” urges that lie just under the surface of today’s domesticated indoor moggy. They encourage owners to observe their cats’ specific inclinations in order to design a personalized environment where they can feel comfortable and confident, and to study both the horizontal and the vertical traffic patterns of their homes, especially areas where multiple pets and humans are pushed together and conflicts can quickly arise. Once these parameters have been established, the real fun of “Catification” begins. The rest of the pages are filled with photos of real homes that have been modified in attractive, diverse and often ingenious ways to appeal to their resident felines. These range from a simple row of well-placed shelves to room-size kitty amusement parks, from easy DIY projects using basic and inexpensive materials to behind-the-scenes looks at the custom-built creations seen on the TV show. But the common thread here is that all these cat toys look cool. With a wide variety of ideas and inspiration to suit all homes, styles and budgets, the goal is to make it easy, fun and even chic to show the world that it’s our cat’s home as well as our own.